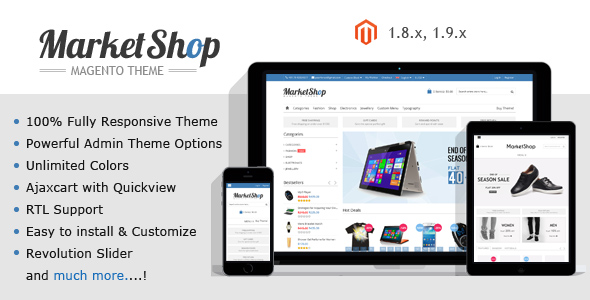 Marketshop is Multi-Purpose premium Magento theme based on Fluid based responsive theme which will enable to run store in any type of resolution without any issue. It’s extremely customisable using advance admin options, easy to install and easy to use for any type of e-commerce store. Header : We have settings for header like enable/disable side header, Sticky header settings, enable/disable wishlist block opacity settings, Breakpoint settings, inner block padding. Menu : Here we have different type of common settings for topmenu like Menu in template width, Vertical menu, Accordian menu, Menu position, enable/disable home link. Brand Slider : Here you can manage to display brand slider on homepage or not, also set limit of brand to display. Revolution Slider : Here you can manage to display revolution slider on homepage. Product Slider : Here you can set all the settings related slider of product like slide speed, autoplay, stop on hover, rawind nav, rewind speed, scrolling item, lazyload. Category Page : Ability to change columncount of product per row, category sidebar position. Blog Options : Here you can change all the design settings related blog block background like color, pattern, images. Brand Options : Here you can change all the design settings related brand block background like color, pattern, images. Extra Settings : Options to change colors of Boxlayout, Social Links, Input Color, Tooltip, Backtotop button. Item Reviewed: Market Shop Ultimate Responsive Magento Theme 9 out of 10 based on 10 ratings. 9 user reviews.